Tis the season to be jolly and charitable! As Christmas draws close, let's cast our mind towards those less fortunate than us and do something really simple to help our fellowman. 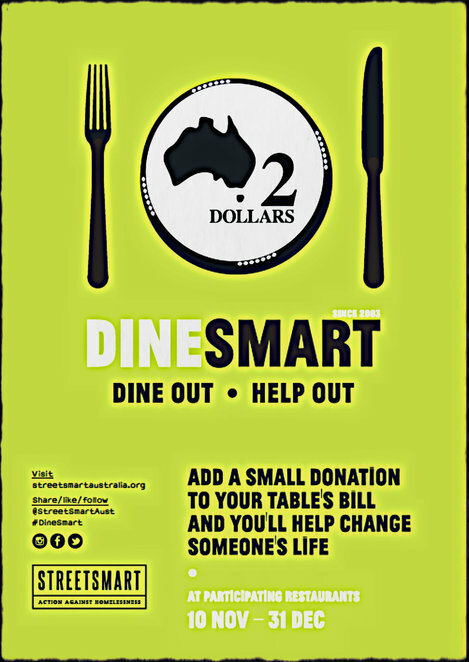 Make a difference this Christmas and support the DineSmart campaign which launches Monday 10 November 2014 and goes through to Wednesday 31 December 2014. In its 12th year, the much needed funds for this campaign goes to local grassroots charities supporting homelessness. 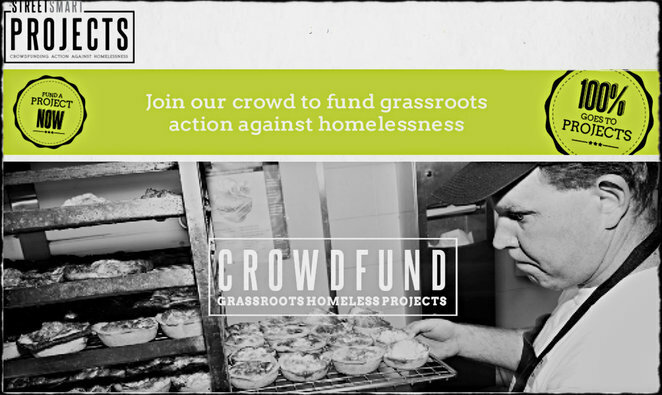 One hundred percent of the funds raised by the participating restaurants go towards homeless organisations and are distributed in the form of grants. All administrative costs to run StreetSmart comes from sponsorship and volunteer involvement. These projects provide critical services, food, shelter and emergency aid and promotes social inclusion, empowerment and sustainable change for the homeless and those at risk. The beauty of it all is its simplicity. Everyone can participate in DineSmart and make a difference with their contribution. Simply organise your annual work Christmas party or gather a group of friends and make a booking at a StreetSmart restaurant. The participating restaurant or cafe will ask you the customer to add on a $2 donation to your bill. Thats it! This small $2 donation from each person can make a huge change in the lives of those less fortunate than ourselves. Just remember no one is going to stop you if your generosity extends to contributing beyond $2. You can also help by asking your local restaurant to be involved. Download THIS FLYER and hand it over to them and ask them to consider being a part of this worthy campaign. 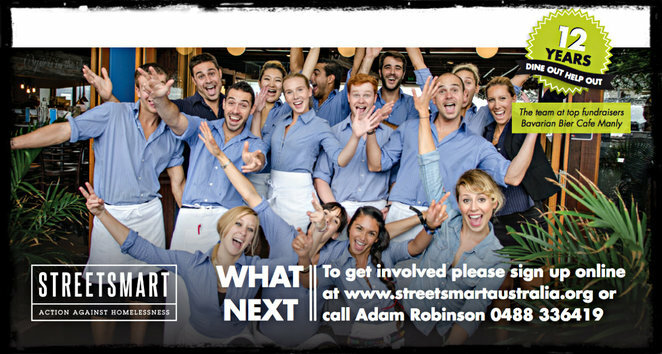 StreetSmart will support the restaurant with bill fold cards, posters and so on, plus a PR campaign to ask diners to 'Dine Out Help Out'. If you're a restaurant owner reading this now and want to be involved in this worthy cause, CLICK HERE to sign up. Everyone can also donate online by CLICKING HERE. To find a DineSmart restaurant, CLICK HERE. So far I found 118 restaurants participating Australia-wide (63 in Victoria, 22 in NSW, 28 in Queensland, 2 in ACT and 3 in South Australia) . They include hot venues such as China Lane, Cho Cho San, Bishop Sessa, Bloodwood, Mamasita, Chin Chin, Pei Modern, Kong, Stokehouse, Hatch & Co and Windy Point. Longstanding DineSmart participants include Cutler & Co Dining Room & Bar, Ezard, Punch Lane, Cafe Sydney, Fix St James, Longrain and The Commoner to name a few. To find out more, go to StreetSmart's website and also 'like' their Facebook Page to keep up with their news. Cost: Donate $2 extra (or more if you wish) on top of the bill for your meal at participating restaurants.